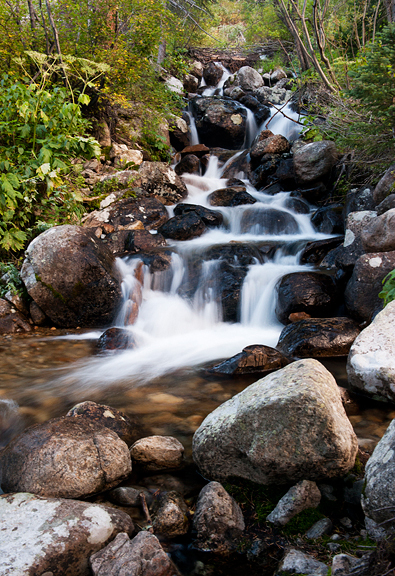 Little pockets of mountain aspens are starting to light up around Colorado. I noticed this as we drove from Crested Butte back to the Front Range – brilliant sparks of gold or red in a sea of green. Every year without fail, some nature photographer will start spouting on about the colors being early and every year the colors are on time. Except last year – they were late and got walloped by early snows. I’ve got my eye on the local stands and once things start to move, it’s time for me to hit the road. In the meantime there has been plenty to do before the fall shoot commences. So that freeze did come as predicted. It also brought our first snowfall of the season by morning. While it was nothing skiable, it was still gorgeous, wonderful snow. 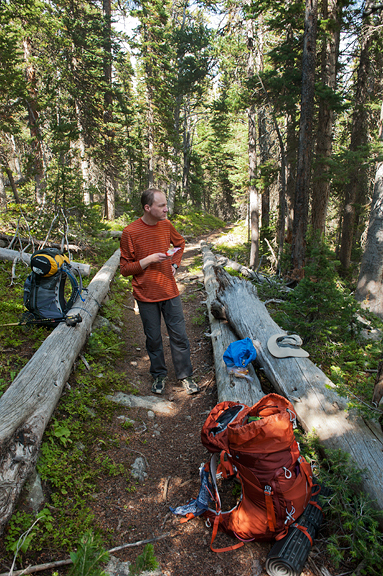 We had a backpacking permit for that morning and I could tell Jeremy was fretting over the weather. Driving up to the trailhead, we emerged out of the cold, grey, wintery world into blue skies, strong sunshine, and an inverted snowline! 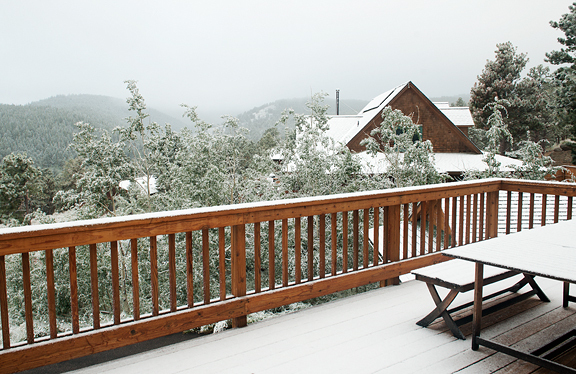 The snow ended above 10,000 feet (but there was also fresh snow on the high peaks above 12,500 feet). It was quite chilly, but we were feeling better about the trip. From our lunch spot, we looked east, beyond the mountains where Boulder and Denver usually punctuate the distant landscape. That morning, the Great Plains had filled up with clouds like a sudsy bubble bath in a tub. We were in another world in the mountains. I love inversions. 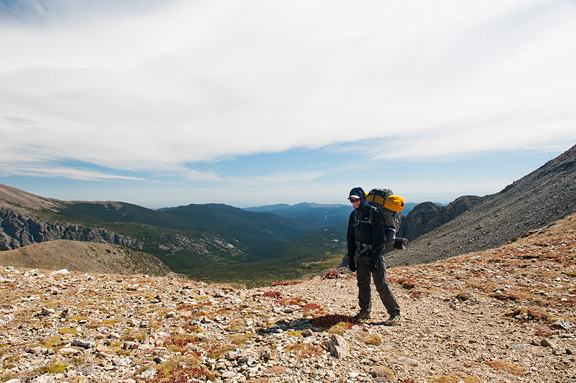 And while it was delightful to have such clear weather overhead, what the photos don’t tell you is how hellish the winds were above treeline. 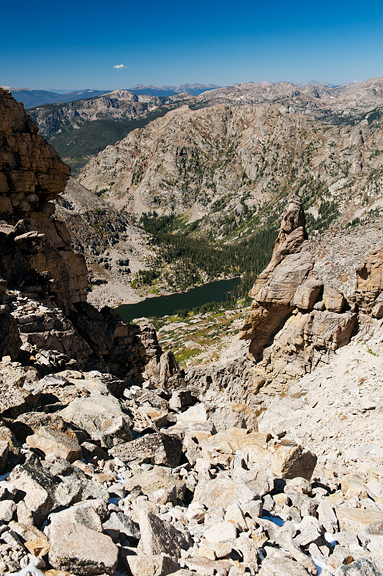 On the other side of Pawnee Pass, the trail drops steeply into the rocky headwall of a cirque. That wasn’t so bad except for slicks of ice and violent gusts up to 45 mph pushing us this way and that. The funnel-shape of that section seemed to focus all of the thermodynamic anger of the atmosphere. After climbing 2100 feet to the pass, we dropped 3600 feet past beautiful Pawnee Lake through huckleberry-strewn hillslopes and forests. I’m happy to report that most of the huckleberries survived the freeze (but not all). 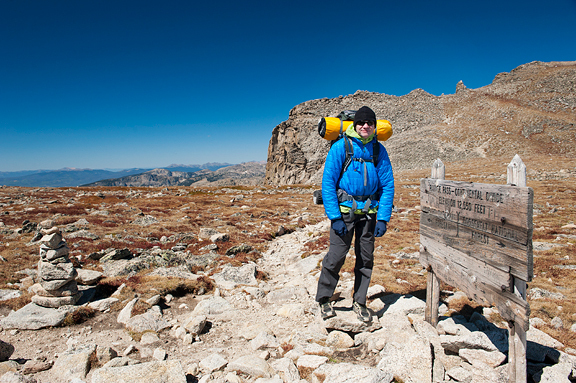 Our route navigated big sunny meadows with giant boulders and downed trees scattered like spilled matchsticks from the previous winter’s avalanches. I found a place I dubbed Raspberry Central for all of the wild raspberry canes drooping with heavy, deep red, sweet berries. 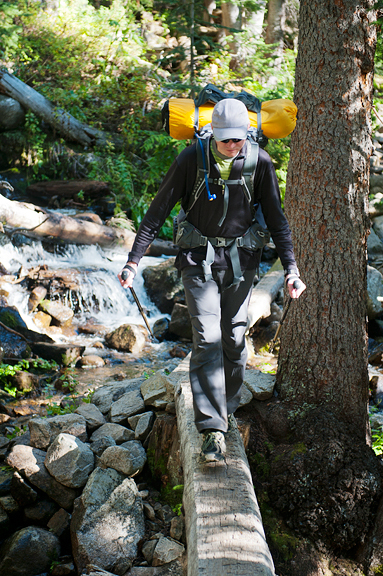 Once we passed the low point of the whole trip (8900 feet), we followed Buchanan Creek up-valley until we found a secluded site away from the trail, with good access to water, 11 miles from our start. I used to have trouble sleeping for more than an hour at a time in the backcountry, but these days I can manage a good 4-6 hours straight. The key is to be so exhausted that you just sleep through anything. We shook the ice off our tent before dawn and pointed ourselves east toward Buchanan Pass in sub-freezing temperatures. When we reached Fox Park, the winds began to pick up. As we rose out of the beautiful basin and out of the protection of the trees, the winds unleashed their full fury the closer we got to the pass. The gusts were even stronger than the day before, forcing us to stumble like drunkards in 60 mph gusts that threw us right, left, forward, and backward. In contrast, the other side of the pass was calm, quiet, and warm. By trip’s end we had 26.2 miles under our feet and 6500 feet of climb/descent. 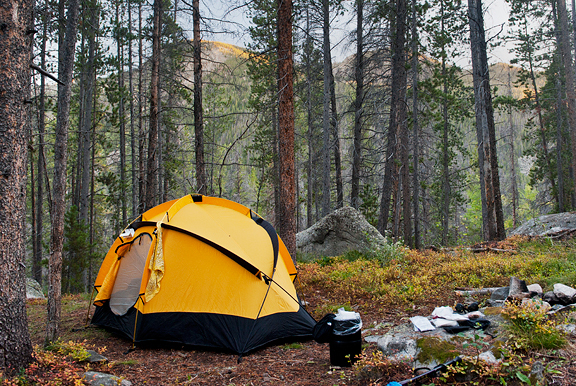 When we got home, we dutifully sorted our gear, set the tent up to dry, and put things away. I only had enough energy to shower and eat half my dinner before I bonked face-first onto the bed yelling, “I love my pillow!” In the morning, my stomach was grumbling on empty and my brain was already focused on what to make for breakfast – because it was Jeremy’s birthday! Bacon. He loves bacon. And eggs. He likes eggs. 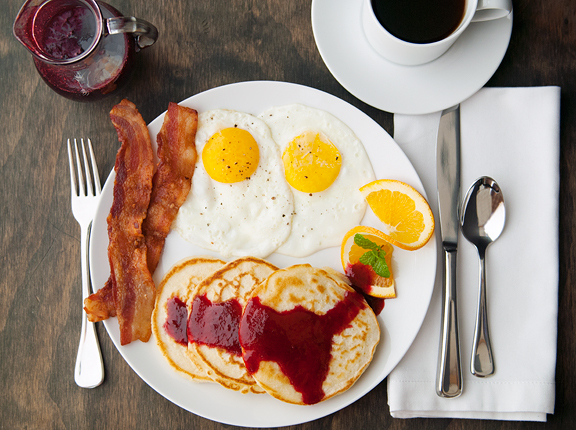 And pancakes with… huckleberry syrup. That’s what birthdays are all about – happy things. 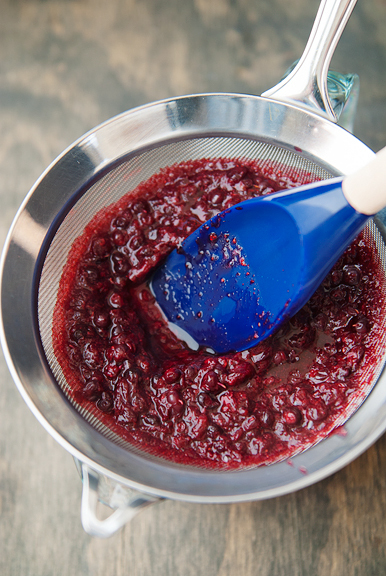 What I like about this recipe is that it works for almost any fresh berry. I think you could do this with frozen berries too. Obviously, I am completely obsessed with huckleberries right now. You can use blueberries as the closest replacement (they are cousins, after all) or go for some other kind of berry you may fancy. Also, it’s easy! I made a half recipe here. They say to gently press on the berries, but not to push pulp through. You know what? 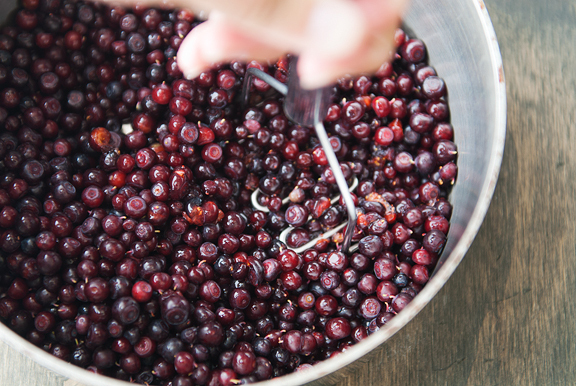 With all of the effort that goes into foraging one cup of huckleberries, I’m going to squeeze as much as I can out of those suckers. 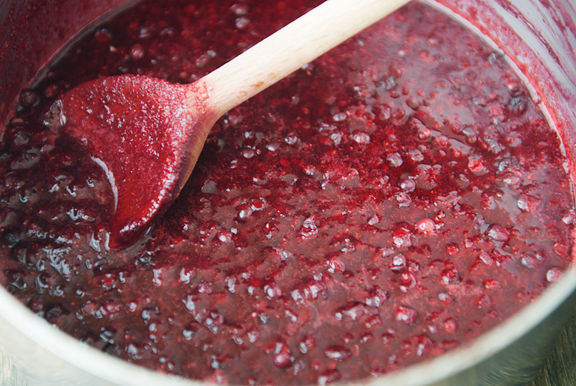 You can take that extra pulp and add some sugar and cook it down for a sweet berry topping of sorts. My liquid yield was just under a cup for a half recipe. You will want to measure out 1/4 cup of sugar for every 1/4 cup of liquid you have (a 1:1 ratio) and put them both in a clean saucepan to reduce to a syrup. Huckleberry syrup (or any berry syrup) is great on pancakes, french toast, waffles, oatmeal, yogurt, crepes, whatever you can think of. My syrup was a little on the thick side, so I whisked in a tablespoon or two of water to get the pouring consistency I wanted and it was perfect. 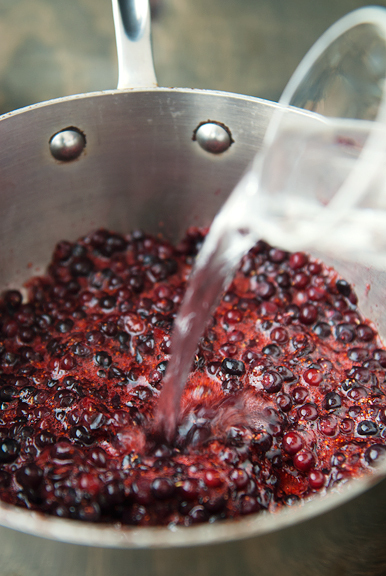 Because the ingredients are water, sugar, and berries, the best berries are going to result in the best tasting syrup. We poured some on homemade vanilla bean ice cream too. 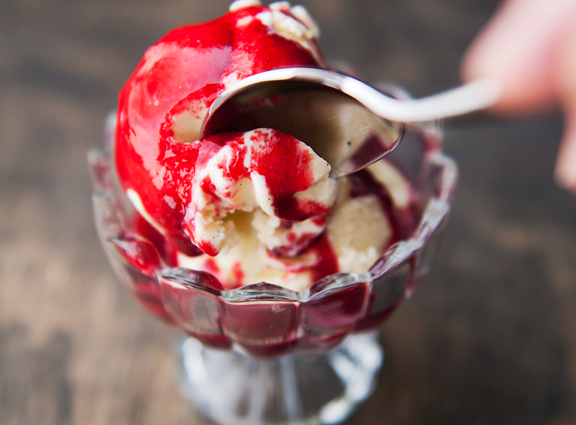 It’s summer in a spoonful! And you can enjoy it all year if you can the syrup (see instructions for canning at Fine Cooking). Place the berries in a medium saucepan. Crush the berries with a potato masher or other flat-bottomed object good for crushing things. Add 1/4 cup (or 1/2 cup if using strawberries) of water to the berries. Bring the berries to a boil over medium heat. Reduce the heat to medium-low and simmer for about 5 minutes. Pour the mixture into a sieve, catching the liquid in a bowl or large measuring cup. You can gently press on the solids with the back of a spoon taking care not to press any of the solids through. Clean the saucepan you just used or get a clean one out. Measure the juice volume. 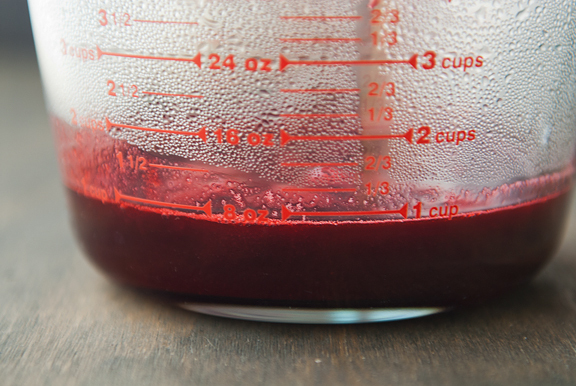 For every 1/4 cup of liquid juice add 1/4 cup of sugar – a 1:1 ratio. 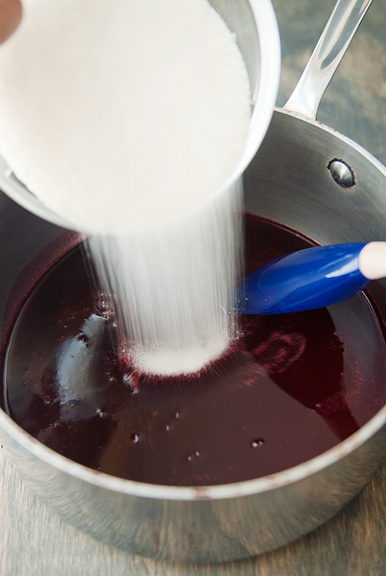 Place the juice and sugar in the clean saucepan. Bring it to a boil over medium heat, stirring to dissolve the sugar. Reduce to low heat and simmer for about a minute until the syrup thickens. Refrigerate for up to 2 weeks. Makes 24 ounces of syrup. Happy belated birthday to Jeremy! Your trip looks wonderful. 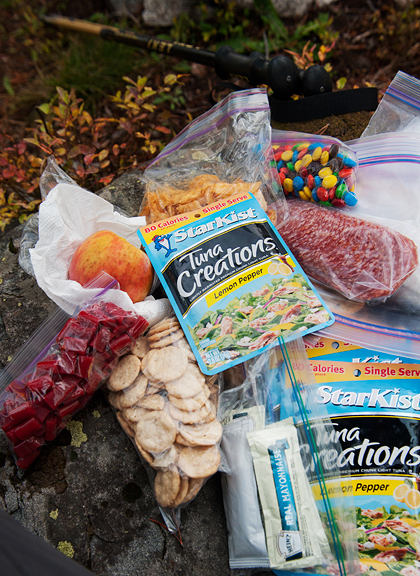 And thanks for sharing more no-cook ideas! Thinking about fun adventures is what is getting me through my youngest’s senior year without being a pathetic mopey mom. 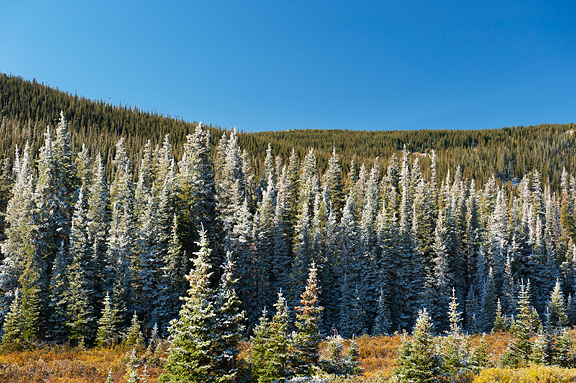 Everything about this post is awesome…except maybe for the first snowfall (!!!) shot. It’s chilly here, but I’m not quite ready for snow yet. I didn’t get outside (at least for leisure, I had a full summer of field research) as much as I wanted to this summer, and I’m aching to do some kind of big fall hike. 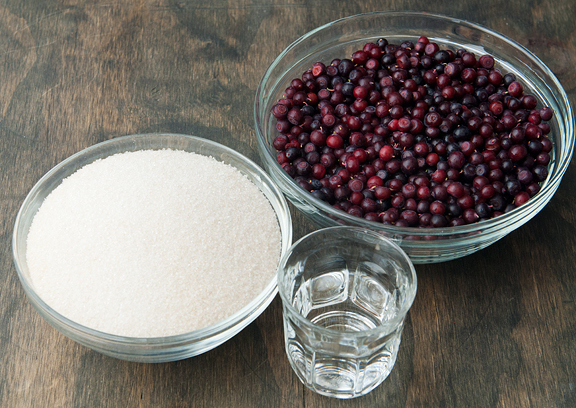 And all of your huckleberry recipes lately have been wonderful. I was so busy studying bees (the wild bees that pollinate blueberry, ironically) in August that I didn’t have time to harvest my yearly blueberry supply! I’m so glad you guys enjoyed your trip and are getting the most out of your huckleberry harvest this year. Your picture of Vanilla bean ice cream is my favorite one and I,d love to taste it when we visit Boulder next month. This syrup looks so beautiful! What a great way to eat foraged berries. 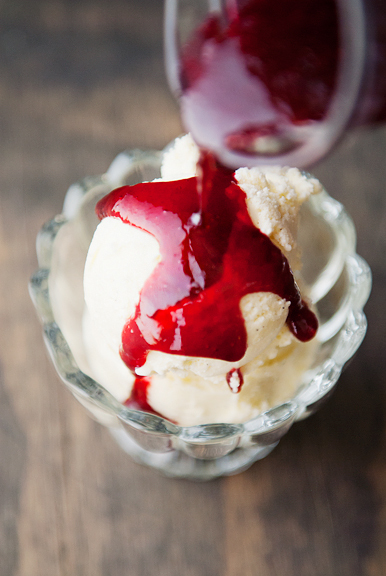 We had a pretty similar blackberry syrup this past weekend, but I would be all over trying your huckleberry version! Happy belated birthday, Jeremy! 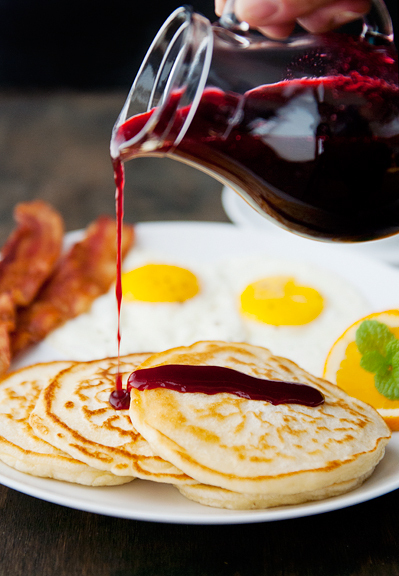 This syrup looks AMAZING! What a great birthday breakfast! it is gorgeous there. love the fresh syrup. What a great camping trip even with the wind blowing you guys backward and forward! That sounds intense. I once camped out in the desert (I hope that counts) albeit dry heat and flat landscaping, but food was provided on the trip. People get so surprised when I tell them that it was my very first time camping. I had to explain that camping is not a Chinese thing to do, but you are the exception and so are your pictures and recipe sharing. Happy belated birthday to your other half. Bacon is good (in moderation)! 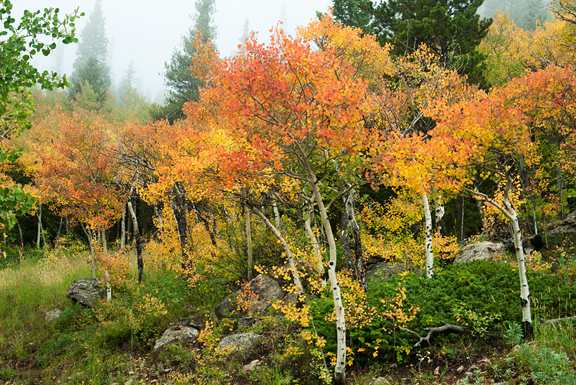 I love the fall color of Aspens. Have been trying to get back there to show Hubby that his native land, Canada, has nothing on the riot of color in CO in autumn. So far we have missed it as our annual migration happens too late. But I fondly remember that color from when I lived in CO as a child and my adventurous Mother took me to see that and Maroon Bells, where we camped by the lake; in those days one could camp there with no one around. Fond memories. Thanks for this wonderful post! I just love your photos!!! 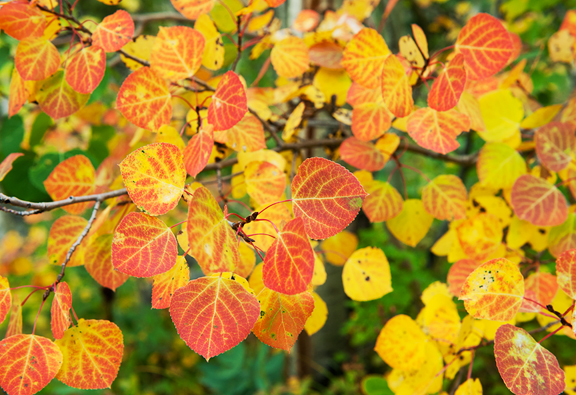 I love all the changes of seasons….but autumn is breathtaking. Just like your huckleberries. I need a sweater that color! Delicious. 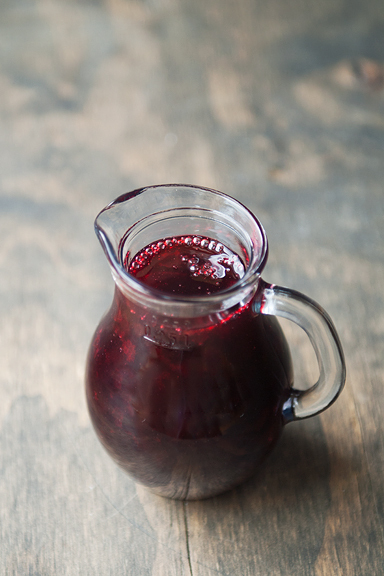 I wish I could get my hands on some of these lovely huckleberries and huckleberry syrup! I really admire that you and Jeremy can get time out of your schedules to go backpacking. Looks amazing and like so much fun! You make me want to move to Colorado ASAP. I do love that area of the USA! Treasure it! Happy belated birthday wishes to Jeremy! I did, once again, vicariously join you for breakfast. How could I not? Brianne – what fascinating research. I always felt the field work was the funnest part of research. Hope you got some blueberries. You can always sub them in for the hucks! Lisa – of course, I will be sure to have some ready for you. Eileen – mmm, I love blackberries too! 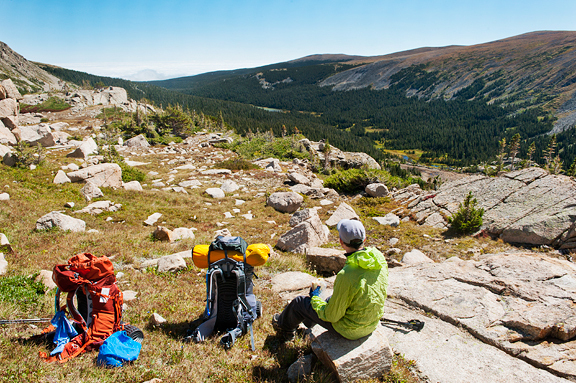 Pey-Lih – I camped with my parents when I was growing up, but I definitely prefer backpacking for the solitude! Jan – ah yes, the bells are a treasure and so lovely. I can’t believe it used to be so secluded, it’s crazy busy in summer (and for the fall colors) these days! jill – I love the color too! Except when it stains my clothes ;) I learned quickly not to wear anything other than black of navy blue when working with the hucks. Surita – we do! And you should!! !